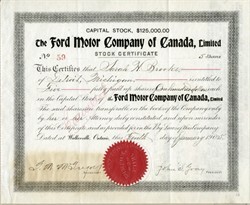 Beautiful RARE certificate #59 from the Ford Motor Car Company of Canada issued in 1905. This historic document was printed by the American Banknote Company and has an ornate border around it with the company's name on top center. This item has the signatures of the Company’s President, John S. Gray and Secretary, Gordon M. McGregor and is over 111 years old. This certificate is the earliest Ford Motor Car Company stock we have had for sale. It was issued the same year the company was incorporated in Canada. The certificate was issued to Sarah H. Brooks and is signed by her on the back. On Jun 17, 1903 Ford Motor Company of the U.S. was organized, and on August 17, 1904, the Ford Motor Company of Canada was founded. John S. Gray was President of both companies and Henry Ford as Vice President. John S. Gray put $10,500 into the new automobile venture, but was skeptical about the long term prospects of the car business. Gray died in 1906 and his heirs collected $26,250,000 when Henry Ford bought their stock in 1919. Ford Motor Company of Canada, Limited was founded in 1904 for the purpose of manufacturing and selling Ford automobiles in Canada and the British Empire. The Ford Motor Company in Detroit transferred the patent and selling rights to the Walkerville Wagon Company, in order to avoid the tariff rates for non-British Empire countries. The Company was originally known as the Walkerville Wagon Works, and was located in Walkerville, Ontario (now incorporated within Windsor, Ontario). The Company President Gordon McGregor convinced a group of investors to invest in Henry Ford's new automobile, which was being produced across the river in Detroit. On August 17, 1904, the Ford Motor Company was founded in Walkerville, Ontario. The Company had gained all Ford patent rights and selling privileges to all parts of the British Empire, except Great Britain and Ireland. The Model C, the first car to be produced in Canada, rolled out of the factory in late September 1904. The Company could produce two cars at a time and in its first full year of production, the Company was able to produce 117 automobiles. The Company's first export sales were to Calcutta, India. The Company is still an important manufacturing enterprise in Windsor. The first car built by the Ford Motor Company of Canada in early 1904 was the Model C. A total of 117 cars were made in the first year. Most were 2-cylinder Model C's but a few 4-cylinder Model B's were also built. Both were made in 1905 along with the Model F, a new 2-cylinder car. In 1906, both the C and B were discontinued, but two new models came on the scene. The Model N was a low-priced 4-cylinder car, but the 406 cid 6-cylinder Model K was huge and expensive. The F was gone by 1907, but there were two new Fords--Model R and Model S. Both were 4-cylinder cars, and built along with the Model N and Model K through much of 1908. Production of all those models ceased when the Model T made its debut in October 1908. The Canadian-made Fords were similar to the American models, although there may have been minor departures due to the use of Canadian components. Ford of Canada constantly tried to keep a high level of Canadian content. During the Model T era, Ford of Canada chose not to produce some body types. For instance, sometimes there were no Canadian 2- door Model T sedans. Four-door Model T sedans were made in Canada before they were in the U.S. Four doors were convenient for people going from province to province where right and left drive laws varied. Some body types were sold under different names. When the American T Runabout was called a Roadster in 1923, Ford of Canada continued calling it a Runabout. It was also in 1923, when Ford called the 2-door sedan a Tudor. Ford of Canada adopted the same name for it, and even went further and called the 4-door sedan a Fordor. Ford used that term for many years, but it originated in Canada and used for five years before it was in the States. The arrival of the Model A brought a much greater variety of body types, though Ford of Canada never produced quite all the body styles made south of the border. Model A station wagons, for instance, were never made in Canada. Ford's famous V-8 was introduced in mid 1932, simultaneously in both countries. Ford of Canada dropped 4-cylinder cars in 1933, while they were on the market a year longer in the U.S. The northern firm produced some body types not made in the States. From 1929 through 1936, Rumble Seat models were available in more varieties for Canadians than Americans. Also for 1936, all Canadian-built Tudors had trunks, while this was not always true in the States. In addition, Canadians were treated to the Special DeLuxe, a top-line series of 10 models above the DeLuxe. The little 134 cid 60 hp V-8 appeared in both countries in 1937. It was an economical alternative to the regular V-8. But, Ford of Canada stopped offering it in the 1939 lineup. It continued to be available in the U.S. until the 1941 models arrived. Ford's first 6-cylinder car since the Model K made its debut in the 1941 models. Buyers could choose it or the V-8, but only in the States. Not until many years later did Ford of Canada offer a 6-cylinder engine. The 1941 Fords in both countries came in three series: Special, DeLuxe and Super DeLuxe. There were only two series for 1942, but not the same two in both countries. Ford of Canada kept the entry-level Special and deleted the Super DeLuxe. In contrast, Ford in the States deleted the Special and kept the top-line Super DeLuxe. With the growth in car sales after World War II, Ford of Canada decided to move its head office and build a new assembly plant in Oakville, Ontario. The new Oakville assembly plant was opened in 1953. In order to meet ever increasing demand, the Company opened a new assembly plant in Talbotville, Ontario in 1967. Historically Ford was one of most powerful companies in Canada, and in the 1970s, Ford was the "largest" company in Canada. Ford of Canada celebrated its Centennial in 2004, shortly after the Parent Company Ford in the United States did in 2003. Born in England in 1865, John Stodgell moved to Detroit, Michigan in 1885. In 1897 Stodgell moved to Amherstburg, Ontario where he opened a confectionery and china store. He soon moved to Walkerville and opened a similar business with his brother, Charles J. Stodgell. In 1904 the Stodgell brothers were two of the original stockholders of Ford Canada. Settling on Strabane Avenue, in what would later become Ford City, John Stodgell became a neighbour of Alexander Askin, a descendant of John Askin (fl. 1760-1815) of fur trade fame. At this point Stodgell became interested in collecting local history. He received a number of important documents from his neighbour and collected Native Artifacts and other items of historical note. Most of the Askin Papers were taken to Detroit by Clarence Burton and later turned over to the Detroit Public Library. These papers formed the core of what is today known as the Burton Historical Collection. Stodgell’s collecting activities have allowed a smaller collection of very significant Askin documents to remain in Canada. In addition to Ford Canada, Stodgell also invested in other local companies and purchased land. Some of his property was sold to Ford Canada. He was in the Walkerville Home guard during World War I and was a founding member of the St. Aidan’s Anglican Church in Riverside. His brother Charles went on to become mayor of Walkerville for 1921-1923. John Stodgell and his wife, Emma, had three children: Simeon J. (A notable stockbroker), Charles W., and Camilla, who married John Wigle (Mayor of East Windsor, 1930). During his tenure of office, Wigle was best known for completing the Drouillard Road Underpass which linked East Windsor and Walkerville along Wyandotte Street. Stodgell histoy from Winsor Public Library. According to the Ontario Historical Society, Gordon M. McGregor (1873-1922) had initiated Ford Motor Car Company of Canada with an early type of franchise agreement in 1904, which gave the independent company full rights to Ford patents and vehicles, not only in Canada but also throughout the British Empire. Rights to the British Isles were waived in 1909. The anomalous relationship of Ford Canada to the US corporation lasted until 1995, when the remaining minority shareholders were bought out. McGregor's role as secretary and general manager gave him ample scope to promote the company and to develop a network of branches and dealers across Canada and overseas. Although clearly one of Henry Ford's important and loyal lieutenants, he has never been properly recognized in the multitude of books on the Ford company. David Roberts, an editor with the Dictionary of Canadian Biography, has now rectified this omission in the Ford historiography. He presents a very effective portrait of McGregor and his relationships with the enigmatic and erratic Henry Ford, as well as with other key figures such as Chatham-born James Couzens and the Englishman Percival Perry who developed the Ford subsidiary in Britain. With deep family roots in the Windsor area, McGregor was an active participant in the rapid growth of Motoropolis (a term coined in 1918). As an industrialist and business promoter, he contributed to the urban real estate boom which expanded the existing City of Windsor and Town of Walkerville and resulted in a new wave of suburban incorporations: Ford City (1912), Ojibway (1913) and Riverside (1921). Unprecedented and unplanned growth quickly led to problems with the supporting infrastructure, and McGregor served as the first chairman of the Essex Border Utilities Commission from its formation in 1916.